The Kentucky Medical Association works with affiliated groups to support the best practice of medicine in the Commonwealth. The KMA Alliance assists in the programs of KMA that improve the health and quality of life for Kentuckians. It also promotes health education and encourages participation of volunteers in activities that meet health needs. The Kentucky Foundation for Medical Care, KMA’s charitable arm, is committed to improving the health of all Kentuckians through medical education and public health initiatives. The Foundation has provided grants to organizations that contribute to the public health of their communities and supports public health campaigns across the Commonwealth. The Kentucky Physicians Political Action Committee (KPPAC) increases the medical community's impact on the pro-medicine makeup of the Kentucky General Assembly. It works for public policy that makes it easier for physicians to focus on the provision of health care for their patients. KMA Corporate Affiliates have priority over other companies for sponsorship of KMA events, including the KMA Annual Meeting, seminars and projects. The KMA Corporate Affiliate program offers two levels to meet your marketing needs and provides your company with 12-month exposure to the hard-to-reach physician market in Kentucky. MagMutal employee volunteers help pack hygiene supply kits at The Good Samaritan Health Center. 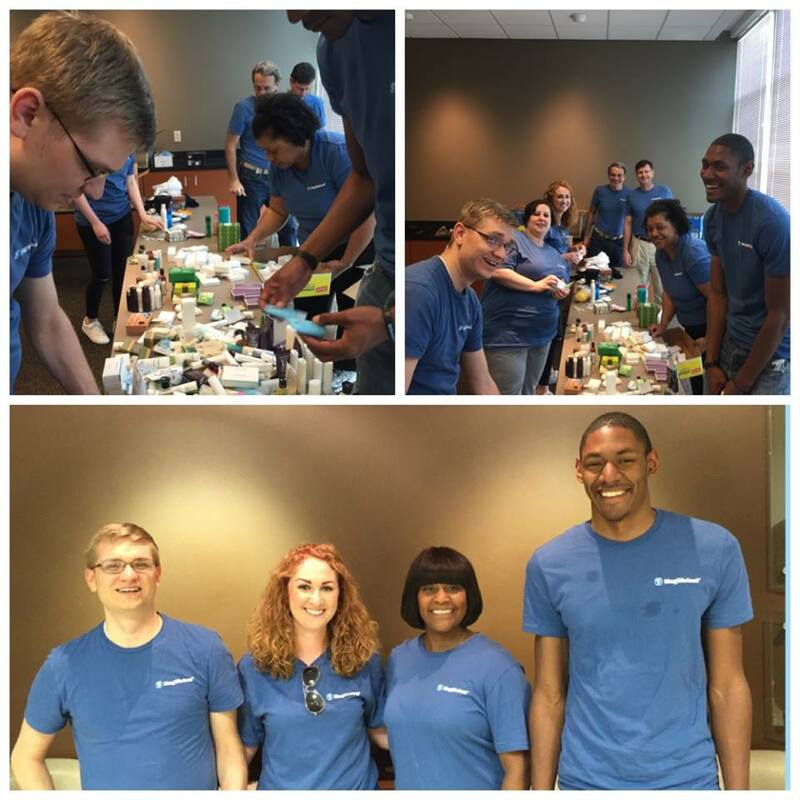 Thanks in large part to employee volunteers at MagMutual Insurance Company, two Atlanta-area non-profits are fulfilling their mission of serving others. For more than 35 years, MagMutual, A KMA Corporate Affiliate, has served as a trusted advocate and strategic advisor to thousands of physicians and hospitals. MagMutual encourages their employees to volunteer in their community. One avenue is through their Dollars For Doers Program. When an employee volunteers 30 or more hours per year with an organization, MagMutual makes a one-time donation in the volunteer’s name of $250. Employees can choose to volunteer at one of three organizations that best matches company values. Two of these organizations currently supported are MedShare and Good Samaritan Health Center. Employees who volunteer at MedShare help sort and repack medical supplies that are shipped around the world. Employees who volunteer at The Good Samaritan Health Center pack hygiene supply kits for their weekly Homeless Clinic Program as well as help pack prenatal birthing kits. MagMutual also sends teams to work on Good Samaritan’s Urban Farm which supplies fresh, naturally grown produce for the local community. KMA endorses MagMutual, one of the leading providers of medical professional liability insurance, as the exclusive insurer for our member physicians, residents and medical students, ensuring the best possible value and service for our members. KMA members receive a 15% premium discount. As the largest medical liability insurer based in the Southeast, MagMutal offers extensive coverage through a network of Kentucky agents specialized in medical malpractice insurance as well as state-specific claims handling, risk management and educational resources. Cornerstone Companies, a healthcare real estate company and KMA Corporate Affiliate headquartered in Indianapolis, Indiana, has developed a philanthropic partnership with Community Health Network to support their behavioral health program in Indianapolis. Community’s behavioral health program includes inpatient care, outpatient care, and five group homes that house patients as they prepare to transition back into daily life. As patients transition out of behavioral health programs, many move into their own apartment without any personal belongings. To help these patients, Cornerstone employees have pledged to build move-in kits filled with essential items such as blankets, sheets, a pillow, food, basic kitchenware, cleaning supplies and paper products. The group homes at Community need regular repairs, and the patient rooms need maintenance when the occupants transition. Cornerstone will provide repair and maintenance services for the group homes as part of this philanthropic partnership. “We chose this partnership because we believe in this important area of healthcare,” said J. Taggart Birge, President and Principal of Cornerstone. According to the American Psychological Association, about 25 percent of all U.S. adults have a mental illness and nearly 50 percent will develop at least one mental illness during their lifetime. The Cornerstone team plans to create 23 move-in kits for Community Health Network in 2017. In the future, Cornerstone plans to include hobby kits, parenting kits and welcome-to-work kits. Cornerstone employees also have the opportunity to volunteer throughout the year. 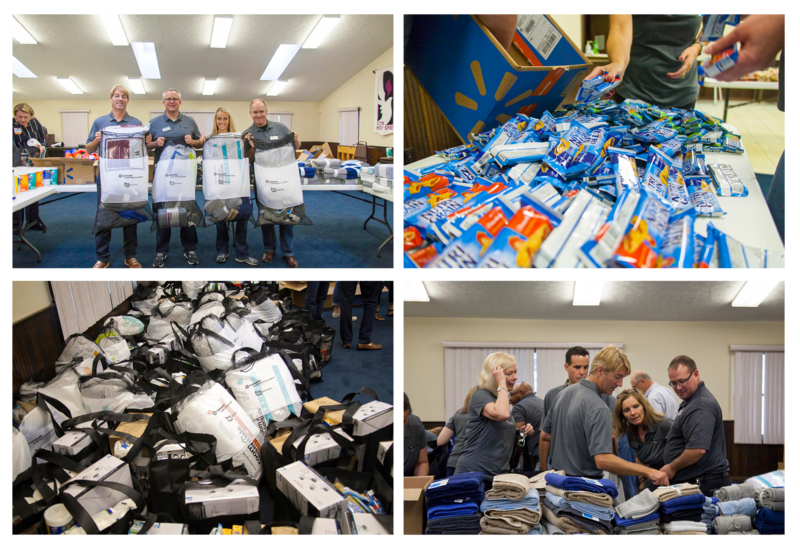 In October 2017, Cornerstone employees from Kentucky, Indiana, Ohio and Michigan came together for a team meeting to kick off the philanthropic partnership. The team had the opportunity to hear a patient testimonial, discuss the impact of the partnership for both organizations, and participate in a group activity to assemble the move-in kits. 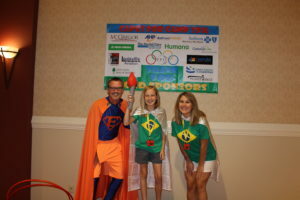 Epic Insurance Solutions President Donald B. Thompson, left, posed with kids participating in the Capes for Camp Program. Don’t be surprised if you see a grown man in tights show up at your office dressed in superhero garb. He dresses this way for a good reason—to raise money for kids with cancer to go to camp for a week. This is the fourth year Fifth Third Insurance-EPIC Insurance Solutions is helping support the initiative through its community service program, EpiCares. This year’s event is June 25. Events include a DJ, photo booth and other fun activities. For one week each year, EPIC Man goes out into the community and visits businesses, clients and people the firm knows to seek donations. Last year’s fundraising goal was $25,000; it’s $40,000 this year. In the past three years, EPIC has helped send more than 300 kids to camp. To support Capes for Kids, contact Charity Cissell, EPIC operations manager at ccissell@epicinsurancesolutions.com or 502-805-3742. Thompson wishes he could take the credit for coming up Capes for Camp. But the idea grew from the camp’s superhero theme one year. “It took on a life of its own,” he said. Now, it’s even incorporated in EPIC’s website. In addition to Capes for Camp, EPIC employees have also chosen to contribute their time and financial support to more than 25 nonprofits since the company was founded in 2013. 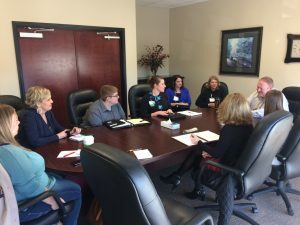 The organization is so dedicated to supporting the community that it formed an EpiCares committee that meets monthly to decide which organizations to support. These organizations include the American Heart Association, the American Red Cross, the Boys and Girls Club, the Fund for the Arts and Metro United Way, for example. “We feel strongly about giving back to the community and being involved in as many ways as we can,” Thompson said. Every two weeks during staff meetings, the company also conducts “payday talks” where leaders invite nonprofit organizations who “line up with Epic’s core values” to let employees know about opportunities at their organization. For those employees who choose to participate in EpiCare’s Capes for Camp, “It’s a great ‘feel good’ for all of us to be involved and to be able to help these kids out,” Thompson said. Members of the Kentucky Interagency Council on Homelessness, including KY DDS, meet to discuss a new initiative to stop homelessness in Lexington. Kentucky Disability Determination Services (KY DDS), a KMA Level 1 Corporate Affiliate, is doing its part to help the homeless in Kentucky who need disability assistance as part of the Kentucky Interagency Council on Homelessness. The council is made up of representatives from various organizations from around the state with the shared goal of ending chronic homelessness in Kentucky. It is currently working on several initiatives toward this end, one of which is Supplemental Security Income (SSI)/Social Security Disability Insurance (SSDI), Outreach, Access and Recovery Program, or SOAR. Three SOAR projects are working to help homeless people around the state. Two programs—Phoenix Health Care, a medical treatment facility in Louisville, and Welcome House, a homeless shelter in Northern Kentucky—are already operating. A new initiative in Fayette County will launch this year. SOAR’s goal is to increase access to SSI/SSDI for eligible adults who are experiencing or at risk of homelessness and have a mental illness, medical impairment, and/or a co-occurring substance use disorder. The programs often are better able to connect with the homeless than is KY DDS. The agency, which makes Social Security disability determinations for Kentuckians, is part of the state’s Cabinet for Health and Family Services. The SOAR projects often can obtain information and help ensure homeless Kentuckians attend medical exams. And it works for real people in need. Take, for example, the story of a man in his upper 50s who had worked at a local grocery store for decades. He had a long history of post-traumatic stress disorder, depression and several physical ailments. He lost his job because of a hospital stay and became homeless. While he was in the hospital, a mental health worker referred him to Welcome House. The program helped move him to an emergency shelter, obtain a primary health care physician and assess whether he would quality for disability. In just 36 days, KY DDS was able to complete the claim that allowed him to find housing and a source of income. Once approved, claimants can maintain housing, purchase food and clothing and, in some instances, even pay back debt. Passport Health Plan has been a cornerstone in Kentucky’s efforts to improve the health and quality of their members for nearly 20 years. The plan’s community-based, provider-sponsored, nonprofit model has been an example of a successful Medicaid program both in Kentucky and around the nation. Passport, a KMA Level One Corporate Affiliate, works with providers and community organizations to give back to the community through grants, donations and sponsorship programs. For instance, several members of the Passport executive team collaborated with Kentucky clinicians on ways to create compassion in health care through a partnership with Compassionate Louisville. Passport works with Healthy Hoops Kentucky to co-sponsor an event that uses basketball and fun to focus on the needs of asthmatic children and their parents. The GoNoodle partnership helped more than 12,000 teachers and 240,000 kids in 700 elementary schools throughout the Commonwealth to get moving in the classroom. Last year, Passport expanded its services to nearly 300,000 Kentucky Medicaid members, increased its staff to 500 associates and expanded its provider network to meet the growing needs of members, particularly in rural areas. The company also re-entered the Medicare marketplace and continued to grow community partnerships. Just this year, Passport created a Medicaid Center of Excellence in Louisville through an alliance with Evolent Health LLC to offer centralized services for provider-led Medicaid health plans nationwide. For the ninth year in a row, Passport continues to hold an A+ rating from the Better Business Bureau and one needs only to look at what Passport members say to understand why. “In all my years of having to pay hundreds of dollars for insurance, this by far is the nicest and friendliest organization I have ever dealt with,” one Passport member said in Passport’s Annual Report. Currently the top-rated Medicaid plan in Kentucky, Passport achieved a 4 out of 5 star rating from the National Committee for Quality Assurance and is also the top-ranked plan in Star Ratings by the Kentucky Department for Medicaid Services. Passport membership has grown by 35 percent since 2014, now totaling over 282,000 members. Passport Health Plan (Passport) is a local nonprofit community-based health plan administering Kentucky Medicaid and Medicare benefits. Since 1997, Passport has been working closely with local providers and community advocates to fulfill their mission, to improve the health and quality of life of their members. Over 500 caring, dedicated staff are all focused on their pursuit to help Kentuckians live healthier lives.